Wed 7/11, 9 PM, Empty Bottle, $12. Thu 6/28, 10 PM, Berlin, 11 PM with an RSVP and $7 after. When Mike Perry and Austin Keultjes, aka Supreme Cuts, show up to talk to me at Joy Yee in Chinatown, they're visibly exhausted from spending the day moving into a new practice space just north of Pilsen. They haven't eaten since they woke up, and when our meal arrives the interview is derailed temporarily as Perry and Keultjes concentrate intensely on wolfing down a staggering amount of Chinese food. 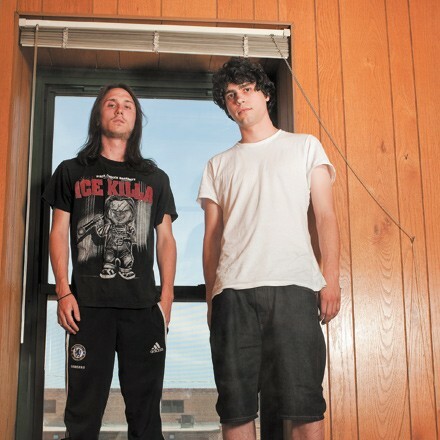 The two of them, both producers, make hazy, hip-hop-inflected experimental electronic music, and they go at it the way they're attacking their dinners—lately Supreme Cuts have been living, breathing, and eating music, working with an intensity that rivals Rollins-­era Black Flag. They got together in late 2010, and at first they weren't terribly prolific—but the seeds they sowed back then are now bearing fruit. They produced two tracks on last month's Oxyconteen EP by Haleek Maul, a teenage Brooklyn rapper from Barbados. On July 10 they'll drop their first full-length album, an instrumental follow-up to last year's Trouble EP called Whispers in the Dark (Dovecote). In August they'll release a mix tape for the increasingly legitimate-looking in-house label of streetwear line Mishka, featuring Maul and a diverse cast of guest rappers that includes Main Attrakionz, Das Racist's Kool A.D., and Chicago phenom ShowYouSuck. That's all on top of the remixes they've been doing (Holy Other's "Touch," Wise Blood's "Loud Mouths") and their beats-for-hire work (for clients including Main Attrakionz). They're about to travel to New York to play a show as Maul's backing band, and in August they'll tour for a couple weeks opening for Polica. This fall they'll start work on another LP, this one with vocals. So far Supreme Cuts' hustle has earned them a respectable amount of attention from blogs that help shape underground dance-­music sensibilities, including heavyweights the Fader and Resident Advisor. But their ultimate aim is nothing less than legitimate pop-chart presence: "That's been our goal from the start," Keultjes says. Their ambitious beats aren't exactly the sort of thing you'd expect a pop audience to like, though—"Lessons of Darkness (Apology)," from Whispers, begins with vaguely tribal percussion, then drifts into synthesizer psychedelia that could've soundtracked an episode of Carl Sagan's Cosmos, if not for its syncopated quasi-R&B groove. "You notice," Keultjes explains, "that underground music and radio music are getting so—like, by the day—closer and closer. And I don't see the reason that just because of who I am there needs to be a divider there." (By "who I am" he apparently means "someone who dresses like a stoner art student.") If you need evidence that Keultjes is onto something, consider the songs (aside from "Call Me Maybe") that have defined 2012 so far: Kanye's "Mercy" and Nicki Minaj's "Beez in the Trap" both use radically strange beats and rhythms that would have been considered avant-garde even a few years ago but are now blasting out of car stereos around the world, and they're not alone. "When I'm making songs and then hearing similar ideas come out on the radio," Keultjes says, "it just feels like it's up to me to step up and kind of help push the radio forward a little bit." Perry, who's originally from California, and Keultjes, who's from South Bend, have known each other for four years, though they were only casual acquaintances before they started Supreme Cuts. They quickly discovered they were creatively compatible, and they conceptualize and create all their songs from the ground up as collaborations. "We just start with a kick and then it just goes from there," says Perry. "We take turns every three additions to it, just so it's fair." Because they like to sample from field recordings, refuse to sample complete melodic phrases (though they frequently lift individual tones), and reject machine-accurate programming ("I feel like a lot of it gets kind of lost when everything's too perfect," says Perry), their music sounds as organic as their process. They play some parts in real time rather than sequencing them, and the parts they do sequence they often refrain from quantizing—that is, aligning the individual notes to an exact rhythmic grid. Any given Supreme Cuts song is difficult to slot into one particular category, and their total body of work is entirely impossible to pigeonhole. Sometimes a track will drift close enough to a genre to read as hip-hop or dance music, but the next will inevitably do something completely different. This is by design. Keultjes and Perry are well aware that the tastemakers who've brought them this far are fickle and likely to abandon a trendy sound as soon as another one pops up—staying tough to pin down strikes them as the best way to avoid what Perry calls the "rinse factor." It also complements the restless aesthetic temperament they share. "If we locked ourselves down," says Keultjes, "and were like, we're a house act or a dubstep act, I know I'd get bored with that in a year. Luckily now we can be in an R&B mood one day, we can be in an aggressive hip-hop mood the next day, we can be in a 'dancing song for the ladies' mood the next day." Supreme Cuts are about to get a chance to see how well their music plays with the biggest, most mainstream crowd that's been exposed to it yet. Maroon 5's label e-mailed Dovecote about having Supreme Cuts provide a remix for the "deluxe" edition of Maroon 5's new album, Overexposed (a Target exclusive in the States), which will be out by press time; when Keultjes saw the message, he was on his way to a dishwashing job, and he turned around and never went back. He and Perry ended up doing one of two remixes of the record's lead single, "Payphone" (with Wiz Khalifa), and they're admirably unembarrassed about it. "If you want to hate us just because it's Maroon 5, go for it," says Keultjes. "I like the track." "That was definitely strange," says Perry. "Just a strange, I don't know, situation. For them to choose us was kind of like, what? We hadn't really listened to the song, but we're obviously aware of the group. We've got radios, you know what I mean?"